I will continue with one more of my favorite olive foods: olive bread. In Greek it is called Eliopsomo. This bread is really something else; it can be a small meal, a snack, breakfast and an appetizer. I remember having a piece of this moist savory bread after a day on the beach and it just hit the spot. This bread makes a good snack nutritionally: the olives provide some fat while the feta some protein and the whole-wheat flour will give you fiber. These three nutritional components (fat, protein, fiber) provide satiety, making it an ideal snack or small meal. Of course you are getting some good antioxidants from the olives as well. Now authentic Greek olive bread is of course vegetarian, and something Greeks could snack on during their religious fasts that prohibited animal products. My version includes cheese so although it wouldn’t be appropriate for Greek fasting, it is OK for vegetarians who also consume dairy. I also used half whole-wheat flour making it a bit healthier and heartier. Olive bread can be made without olive oil or with a lot of olive oil. I used just a bit, added 3 different types of olives (Kalamata, Greek Green Olives and Throubes) and the feta, as I wanted this bread more for a snack or breakfast. 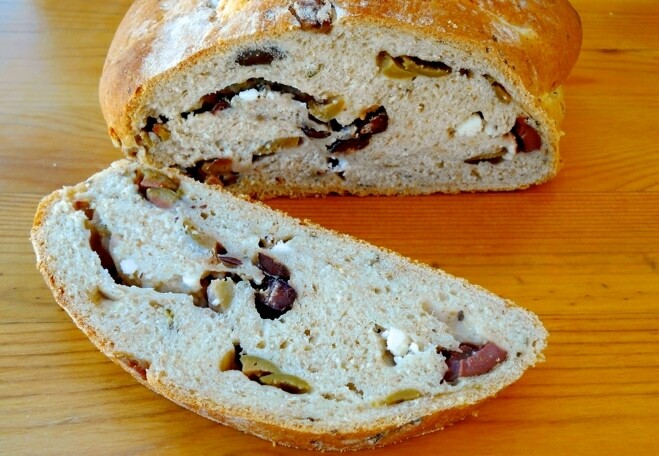 If you intend on using this bread with dinner, than you can omit the feta and use less olives. For an appetizer you can cut into cubes and serve with a bit of olive oil. For a snack just slice it and eat it. Our two little loaves were gone in a day. And yes, this bread tastes much better after a day. And don’t forget to store in the refrigerator, as there is cheese in there. I know, many of you will think that making bread is really time-consuming and well, difficult. Well it isn’t really. There is some waiting time involved (about 1 1/2 hour) but other than that, everything else is pretty straightforward. I did not use a mixer to knead the dough this time, I did it by hand, and I’ve provided a link with photos. But if you use a machine just make the basic dough following the instructions and then do the rest by hand. In a large bowl mix the instant yeast with the flour and then add the water. Add the salt and olive oil and mix well. Now place the dough on a floured surface and start kneading. Stretch the dough away from you and then roll it back in. 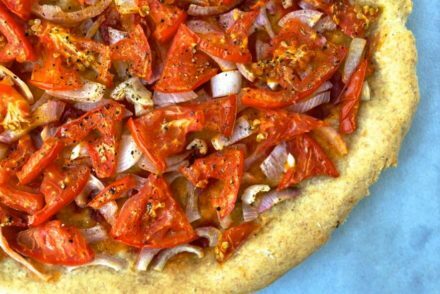 Do this several times until dough is elastic and smooth. It took me about 7-10 minutes. Roll in a ball and cover with plastic wrap and put in a bowl. Cover the bowl with a towel and let it sit somewhere warm for about an hour. Take the ball and separate in 2 balls. Stretch the ball so that you have a long piece of dough. Pour in there half the olives, half of the feta and half of the oregano. Form again in a ball making sure all the olives are tucked inside. Do the same with the other piece of dough. Preheat oven at 425 degrees Fahrenheit (220 degrees Celsius). Sprinkle some flour on top of each piece of dough and make a small slit. Due to the olives and feta, this bread is a bit moist; so let it cool down a bit before serving, otherwise it may fall apart. Yum! 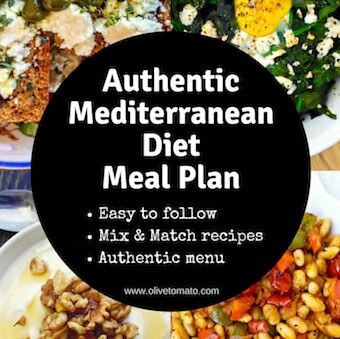 I love feta and olives together – I could eat that all day. 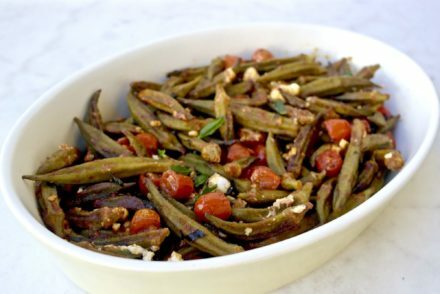 My Persian husband is going to love to this recipe, he eats Feta like no person I know. Great recipe, thank you! Just curious, if you add more olive oil to the bread how does it change the texture of the crumb, do you know? I’m a fairly novice baker but this recipe turned out pretty well for me. The only problem: it didn’t rise as much as I’d have liked, and the end result was kind of dense! Would increasing the yeast or decreasing the flour help, or should I activate the yeast first in warm water before adding to the bread? Activating the yeast may help. Also whole wheat flour can have that effect. You may want to try changing the ration of whole wheat flour to regular flour. 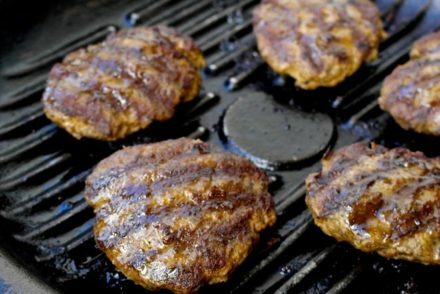 Hi, I live in the UK what is the equivalent of all-purpose flour for this recipe? Is it strong bread flour, or plain flour? Hi Emilia, The equivalent would be regular flour.